Could a diet of whipped cream, butter, and bacon help you peel off pounds? The keto diet – the latest weight loss craze – is high in fat, low in carbs, and moderate in protein. It’s so high in fat you’re actually encouraged to eat creamy, full-fat yogurt and cheese, whipped cream, and even butter. You read that right — even butter!. Most keto diet plans recommend eating about 70% of your calories as fat, 25% from protein, and just 5% as carbs. So, butter and cheese are on the menu, but pasta, rice and most other high carb foods definitely are considered off limits. The idea is that by keeping carbs to a bare minimum (about the amount that you’d get by eating one or two apples a day), you’ll enter a metabolic state called ketosis that forces your body to burn fat as fuel. While not a traditional ‘calorie counting’ diet, you do have to keep close tabs on carbohydrates. For most people, sticking with 20g to 50g of net carbs (subtract fiber from total carbs to calculate net carbs), will result in a state of ketosis. While full fat dairy and cheese may sound wonderful, is the keto diet really a good way to lose weight? Some studies suggest that the answer is ‘it depends’. Increasingly, researchers are concluding that the weight loss plan that works is the one that you can stick with – be it high carb/low fat, high protein/low carb, or high fat/low carb. In my weight loss counseling experience, a significant cut to a whole macronutrient group, like carbohydrates, is very hard for most people to maintain in the long term. And, numerous studies show that what’s most important for long-term weight loss success is adherence, so if you can’t stick with a plan for life, it’s probably not going to give you the results you want. There’s also plenty of evidence to show that having a more balanced plan (say, following the USDA recommendation of 45 to 65 percent carbohydrates, 10 to 30 percent protein, 25 to 35 percent fat) while keeping calories moderate (for your age, gender, activity level, etc.) can also help you lose weight. Some research suggests that ketogenic diets might help lower your risk of heart disease and benefit people with epilepsy, metabolic syndrome, insulin resistance, and type 2 diabetes. 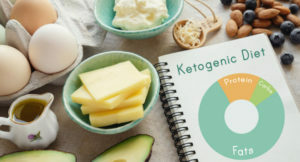 Studies are also exploring the potential of ketogenic diets for people with neurodegenerative disorders (such as multiple sclerosis, Parkinson’s, and Alzheimer’s). If you have one of these conditions, you should check with your doctor to see if a low carb diet could help. As a general rule, for most people trying to slim down and tone up, I don’t recommend diets that are very high or low in specific macronutrient groups. I believe there are easier, more balanced approaches to lasting weight loss. That said, there are some people who can adhere to very restrictive diets long term, and for a small percentage of people, it’s possible that the keto diet may be beneficial. Personally, I would not want to live in a world without fruit, pasta, bread, rice, and the occasional piece of cake or cookie. Many carbs are not only delicious and satisfying, but also rich in key nutrients, like fiber, B-vitamins and iron. However, if you think that you can cut your carbs to 50 grams or less per day, you might want to ask your doctor whether you should give the keto diet a try. Always check with your physician before starting any weight loss plan. I have heard before about ketogenic diet but have never tried this. As i have some extra pounds on my body i heat gym everyday i am clueless about diet. I would like to follow this keto diet. Thanks for sharing. Keto diet is getting popular among people and is being practiced by many.As you have said this diet focus on keeping carbohydrate consumption to a minimum level.Whereas it supports the intake of more amount of fats .This feature actually makes this diet plan very different from others.Because other diet plans strictly asks for low fat intake.Anyhow,people of many nations use rice,bread etc. as their staple food.Such people may find a little bit difficult to follow this diet.However,if this diet has so many advantages we should give it a try. Before this, I never heard about this recipe, But now I’ll try this at my home. Thanks for sharing.